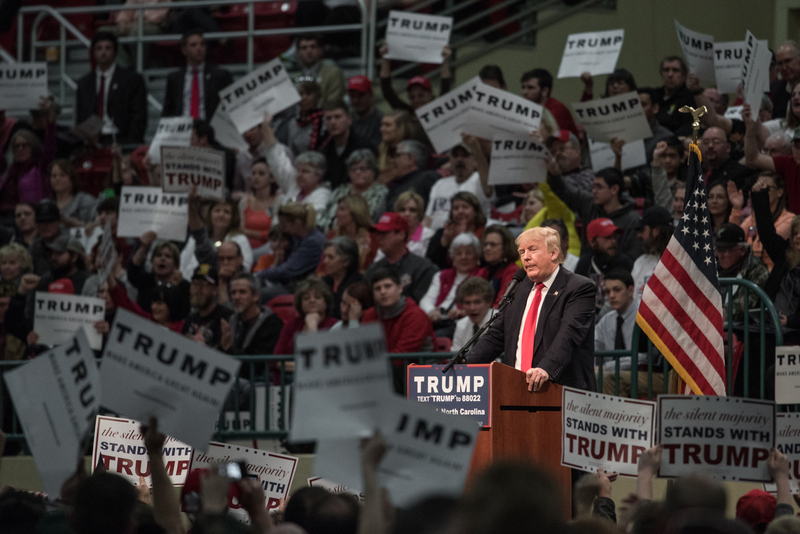 Donald Trump's Super Tuesday speech last week was hard to beat. He vowed to make America great again, made jabs at Hillary Clinton, and had us all convinced that New Jersey Gov. Chris Christie totally regretted his endorsement of the Republican frontrunner. As Republican primaries continue March 8 in Hawaii, Idaho, Michigan, and Mississippi — with a total of 150 delegates at stake — we're sure to see some big wins for the businessman tonight, along with another "winning" Trump victory speech from Florida. The presidential frontrunner was in South Florida where he held a press conference at the Trump National Golf Club in Jupiter. According to a POLITICO survey of Republican party panelists -- "operatives, activists, strategists and elected officials in ... battleground states" -- taken last week, Trump was ahead in the polls in most of the March 8 states leading up to Tuesday's primaries. On Tuesday, he won Mississippi with 47.3 percent of the vote, and Michigan with 36.5 percent, and is expected to do well in Idaho as well. With early polling data available, Trump was projected to win Mississippi and Michigan — and did. In both states, GOP primary voters are supporters of mass deportations and have expressed dissatisfaction and anger at the federal government, which is why they may have been more likely to vote Trump. I've never had so many horrible, horrible things said about me in one week ... $38 million worth of horrible lies. But that didn't stop Trump from saying "a few horrible things" himself about some of the people who have been jabbing at him lately. During his speech, the businessman defended his bottled water, his steaks, his airline, and Trump University just a day after Mitt Romney called the presidential candidate a "phony." We're gonna have borders again, folks, We're gonna have borders. We're gonna have the wall, we're gonna have borders. And people are gonna come to the country. They're gonna come into the country, and they're gonna be very happy. But they're coming in legally. They have to come in legally. He called out South Carolina Sen. Lindsey Graham's recent comments about him, stating "Every single person that's attacked me has gone down. I don't want to mention names — let's not mention names. They're gone. We started out with 17, and we're down to four — pretty much four. There's only one person who did well tonight: Donald Trump." And, of course, he spoke to his ability to be a unifier who gets along with people, but he also made a dangerous comment in regards to the politicians and media who have attacked him over the course of his campaign. They've attacked me viciously and every single one who's attacked me is gone. And I'm very proud of that because, because that's what we should have for our country. Taking this comment to the extent of "what we should have for our country" is already a dangerous rhetoric that has circulated since the start of his campaign, where he's attacked Mexican immigrants, the black community, women, Muslims, and physically disabled individuals. This is also already happening at Trump rallies around the country, such as an event in Georgia where 30 black students were told to leave before the event even began.